We are sure that many Readers will feel like singing the song “Happy Talk” as they reflect that UKIP now has two dozen MEPs to send to Brussels and Strasbourg. “Happy Talk” is of course from the 1949 Rodgers and Hammerstein musical South Pacific. It is sung by Bloody Mary to the American lieutenant Joe Cable, about having a happy life, after he begins romancing her daughter Liat. Liat performs the song with hand gestures as Mary sings. The image for this article has been carefully chosen. 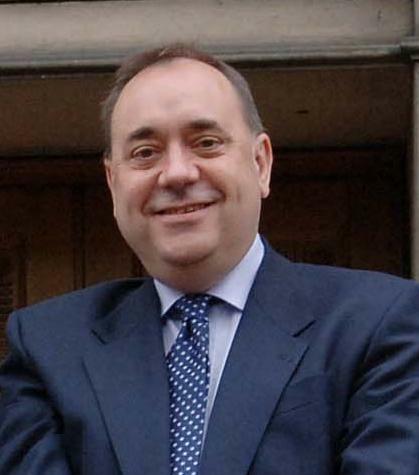 It is the smiling face of Alex Salmond. Mr Salmond has a problem that all UKIP members should take note of: Mr Salmond is campaigning for a Yes vote in the cessation referendum to be held on Thursday 18th September, 2014. Mr Salmond’s problem – and it is a big one – is that if he persuades the Scottish People to vote the way he states he wants them to vote, the result will be disastrous – for Scotland. Mr Salmond’s best hope is that the Scots vote to stay within the union and that whichever party wins the May 2015 General Election will legislate what is known as “Devo-Max” for the Scots. This will mean the transfer of further powers from Westminster to Edinburgh. Many readers of this organ will not like what this article states next, but this organ does not exist merely to post articles that contain only things its readers want to see and read. The fact of the matter is this: That Many UKIP members do not take sufficient account of the fact that over three quarters of the governance of this formerly sovereign country is carried out by a foreign power. Yes, UKIP members pay lip service to this but they are still acting as if Westminster still governs this country. Readers have to face reality: Westminster does not rule. The most glaringly obvious example is that the country has no control over its borders. What sort of sovereign state can it be that cannot control this? The most important thing that UKIP members have to do, and they can do it immediately after reading this article is to make the mental adjustment to fully accept the consequences of that which they have paid lip service to. Once the reader has done this they will realise that it matters little which of the three traitors (Cameron, Clegg, Miliband) masquerade as Prime Minister after May 2015. Once you accept this, you can then start to make plans accordingly. What should these plans entail? They should be to promote UKIP in every which way they can. The most important thing for UKIP is to win elections. Every council/Westminster/Euro seat is important. Indeed, every vote is important for it is seats and votes that enable a political party to exist. The immediate focus of course must be helping Roger Helmer win the Newark by-election on Thursday 5th June 2014. After that the party must set is sights on the General Election of May 2015. What readers should now recognise is that Cameron is probably now committed to this course of action. He realises that this pledge has to be implemented and that it would be politically impossible for him to renege on this. The consequences of victory and the consequences of defeat. Both will prove disastrous to UKIP. Let us look at the victory scenario first: What if Cameron won the 2015 election, went to Brussels, came back with a “settlement” put it to the British People and the British People voted to leave the EU? If UKIP are going to campaign for a withdrawal – which of course is the ONLY legal option for to campaign to remain in is TREASON – they have to consider what the consequences will be. These are clear: In the event of a vote to leave Cameron would then return to Brussels and a series of negotiations would take place regarding the withdrawal of the UK from the EU. The problem for UKIP would be that the negotiations would be handled (on the UK’s side) by David Cameron and not Nigel Farage. It is also clear what the reaction of the EU will be. This is most obvious as the reader ALREADY KNOWS what the EU’s reaction is to a referendum result it does not like – it instructs its vassals to simply hold another referendum! The reader HAS to understand that this is EXACTLY what would take place in circumstances regarding the UK’s withdrawal from the EU. The withdrawal negotiations would result in a treaty of withdrawal that would be put to the voters. The reader can bet his or her bottom dollar that these terms would not be at all favourable! After all, consider who will be handling the negotiations! It will not be Nigel Farage! So, we can see the problem: A vote to leave the EU will only result in another referendum to sanction withdrawal on onerous terms. The result of loosing (that would be very high) this second referendum will be disastrous to UKIP. As to the consequences of loosing the initial referendum, these would be nearly as disastrous for UKIP. So, how should UKIP proceed? UKIP should follow the course already laid out in this article. Campaign as hard as possible for as many votes as possible. Its message should concentrate on the pointlessness of voting for the Tories due to the powers handed to the EU. UKIP’s job must be to get the voter to realise that it makes little difference (to them) whether Ed Miliband resides in Number 10 instead of David Cameron. UKIP however should realise that although it will make little difference to the voter, it will make a lot of difference to UKIP. The fact of the mater is this: UKIP’s interests are best served by having Ed Miliband as Prime Minister and not David Cameron. Mr Miliband has set out quite clearly his conditions for an in/out referendum on EU membership. These are any treaty transferring yet more powers to the EU. Given the results of the Euro elections elsewhere in Europe, such is unlikely during the time the 2015 government will be in office. UKIP can therefore be fairly confident that a referendum will not be offered. This – for UKIP – is a good thing for in not offering a referendum, Miliband will help UKIP get more votes. There are other aspects to a Labour victory that will help UKIP. Cameron has already offered Scotland “Devo-Max” in the event of a vote to remain in the union. Labour cannot do other than make the same commitment. Such further devolution will further exacerbate the “West Lothian” issue. Since Miliband will be governing England through Scottish and Welsh members (a type of reverse colonialism unique to England) Milband will be forced to address this issue head on as not addressing it will be politically unavoidable. There are two answers to the West Lothian question and we already know which answer Miliband will chose – the wrong one! The right answer is of course to restrict the voting rights of Scottish and Welsh members (of the Commons) in indirect proportion to the devolved competences to those nations. This is something Miliband will not do as it would remove his majority! Miliband will instead implement the wrong answer. The reader already knows what this answer is: the hated elected regional assemblies! Miliband will implement legislation to set these up. There will not be referendums as Miliband will not want to risk the voters rejecting his plans. These assemblies will have some powers devolved down from Westminster and other powers removed from the local authorities below them. Additionally, we already know that these assemblies will be made up of full time salaried elected members and that a system of proportional representation will be used to elect them. This is most likely to be the additional member system – as used by the Germans! The result therefore will be to set up a dozen assemblies in England all of which will present excellent opportunities for UKIP! Thus the result – for UKIP – of a Labour victory in 2015 will be more UKIP members voted into elected positions! This has to be good news! More elected members will result in more party members. These UKIP people will gain experience. This will help overcome UKIP’s chief weakness – lack of members experienced in elected office – as compared to the other parties. What about the EU? We here you ask! What the results of the 2014 vote illustrate is that the EU has now turned a corner. The new anti federalist parties will bring about the start of a disintegration of the EU. It will take time but the British Gazette is now quietly confident that the EU will begin to disintegrate. It won’t happen overnight. It will start slowly, but the process has already begun. UKIP’s job is to get new members, get people elected so they can gain experience of elected politics so they can be there when the collapse comes about.